Achieve better and more vibrant colors when using Image Armor DARK. The Original Image Armor DARK Formula helped change the pretreating industry back in 2013. It was a much improved formula over what was currently on the market allowing for a variety of characteristics which included less crystallization of the pretreatment when heat pressing, reduce pretreatment box, greatly improved washability and an increased application window. 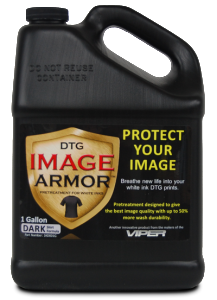 Image Armor DARK Shirt Formula is designed for use with all Dupont ink sets for most of the repurposed Epson DTG printers on the market. Ease of application allows for easier hand spraying of the pretreatment. When applying with a Wagner spray gun, if you aren't sure if you have enough pretreatment on the shirt, simply apply a little bit more - without worrying if the ink will stay adhered to the shirt after washing. The DARK Shirt Formula is designed to be used on midi-dark colored shirts to black garments with white ink printing. A white underbase is required for all CMYK inks being printed otherwise wash ability will suffer.